Join New England mystery writers as they discuss short stories with a murderous twist at the library‘ s annual Sisters in Crime gathering. This year‘ s panel discussion, titled “Death in Shorts” will include authors Kate Flora, Janet Halpin, Ruth McCarty, and Susan Oleksiw, all of whom contributed short stories to Level Best Books‘ new mystery anthology Rogue Wave, or other Level Best mystery anthologies in past years. Copies of the authors‘ books will be available for purchase and signing at the program. The event is free and no reservations are required. With Seven Bridge Writers Collaborative, Level Best Books will present a “Death in Shorts” mystery short story panel with Rogue Wave authors, Janet Halpin, Ruth M. McCarty, Dale T. Phillips and co-editor Leslie Wheeler. Ruth will appear on a Level Best Books panel with authors Leslie Wheeler, Katherine Fast, Beth and Ben Oak. Ruth is on a panel, “Death in Shorts," with Leslie Wheeler and Michael Nethercott. 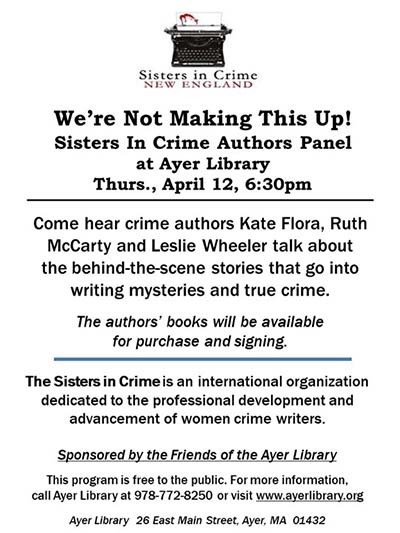 Ruth will be hosting a Sisters in Crime panel “It’s a Mystery to Me” - Panelists are Lucy Burdette, Rosemary Herbert and Katherine Hall Page. They Love Lucy: If Lucy Ricardo Were A Sleuth - The moderator will be Ruth M. McCarty. This panel will address how some amateur sleuths and their sidekicks seem to run into trouble at every turn, sometimes the trouble's wry, sometimes it's slapstick, but it's always funny. Is this a function of the plots or the character or both? Does this trait help sleuthing or hinder it or both? What kind of zany situations have your characters gotten themselves into? Have you ever found you've written yourself into a corner that you didn't know how to rescue your sleuth, and what did you do? The panelists will be Karen Cantwell, Jessie Chandler, Cindy Sample, and Nancy Glass West. Ruth will appear on a “Death in Shorts” panel with Kate Flora and Sharon Daynard. Ruth will be joining local authors to celebrate Bruce’s Browser’s 7th Anniversary. Ruth will be moderating the “Torn from the Headlines” panel on Sunday morning at Crime Bake. The panelists are: Rosemary Herbert, Margaret McLean, Mike Cooper and Gary Braver.